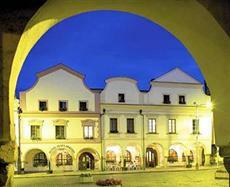 The Hotel Zlata Hvezda is perfectly located for both business and leisure guests to Trebon. The hotel provides all the amenities that today's travelers desire in all of its 50 rooms. Each guestroom has non smoking rooms, bathrobes, daily newspaper, desk, hair dryer, in room safe, television. This beautiful Trebon accommodation provides 24hr room service, shops, elevator, bar/pub, laundry service/dry cleaning, meeting facilities , restaurant, room service to suit all guests' utmost convenience. Hotel's guests can experience on-site latest leisure and sports facilities such as massage, jacuzzi, gym, sauna, spa, water sports (non-motorized).Modern comfort and convenience are seamlessly combined to ensure the guests' satisfaction. The hotel provides a warm and welcoming service of international standard. For your reservation at the Hotel Zlata Hvezda, simply submit your dates and complete our secure online booking form.